WASHINGTON (March 06, 2008) -- Retired Soldiers, modern-day warfighters, television news reporters and Department of Defense civilians lined up March 5 to get a little taste of life in the combat zone. Secretary of the Army Pete Geren hosted a "combat feeding demonstration" at the Pentagon where representatives of the U.S. Army Natick Soldier Research Development and Engineering Center offered up samples of the latest developments in combat chow. Julie Smith, a food technologist with the Department of Defense combat feeding program, provides MSG (ret.) Dwight W. Burton with a piece of chocolate cappuccino cake during the combat feeding demonstration, March 5, at the Pentagon. The demonstration featured a history of various combat feeding options dating from the Civil War through Desert Storm. It also highlighted the technology, quality, taste and variety of combat food options currently being developed or newly fielded by the Army. The chocolate cake will be available in 2009 as part of the "Unitized Group Ration - A" combat feeding system. The secretary said the development of better food and better ways to deliver and prepare that food in combat is important, because taking care of Soldiers means feeding them right. "An Army travels on its stomach," the secretary said. "In this era of persistent conflict, in an era where we have to anticipate that we are going to deploy Soldiers around the world -- combat feeding is an essential part of sustaining our Soldiers that are in the fight. It is a key part of their quality of life." The demonstration featured a history of various combat feeding options dating from the Civil War through Desert Storm. It also highlighted the technology, quality, taste and variety of combat food options currently being developed or newly fielded by the Army. One of those new options is the "First Strike Ration." The new ration is about the size and weight of the brown-packaged "MREs," officially called "Meal, Ready-To-Eat, Individual" in military nomenclature. But the FSR provides the nutritional value of three meals at about the same weight and bulk as a single MRE. Additionally, the FSR contains only food items that can be eaten on the move and that require no heating or preparation, said Jeremy Whitsitt, a spokesman for the labs at Natick. "All the components are eat-out-of-hand, easily accessible and individually wrapped," he said. "Soldiers can rip it open, put everything in their cargo pocket and move out." The FSR contains items like beef jerky, nut and fruit mixtures, energy bars and crackers. The 2,900-calorie ration also includes non-perishable pre-made sandwiches or sealed pouches of chunk chicken or chunk tuna. Natick researches were motivated to develop the FSR in response to the "field stripping" trend commonly associated with the MRE. "One of the concepts that drove this was the field stripping phenomenon," Whitsitt said. "Soldiers throw out portions of the MRE they don't want because it's too heavy to carry, it's too bulky or they don't like them." Whitsett said field stripping of MREs was a concern because those meals are nutritionally balanced as they are. They are designed to provide the right amount of calories, fats, proteins, vitamins and minerals that an active Soldier needs. Tossing portions of the meal meant losing some of that nutritional balance. He said efforts were made to educate Soldiers about the need to eat the entire MRE, but those efforts were in vain. He said Soldiers field strip MREs for practical reasons that -- in typical Soldier fashion -- put the mission before themselves. "It's about mobility, basically. They keep the things they can carry while they are marching," he said. "And you don't have time to eat a 30-minute meal, or even a 15-minute meal, when you're on patrol. That's why we designed the FSR, it's a product that makes it possible to eat on the move." Also on display at the demonstration was the "Unitized Group Ration-Express." The UGR-E feeds about 18 Soldiers and is designed to provide a hot, group meal, in as little as 30 minutes. The UGR-E requires no mobile field kitchen, no power, no water and no equipment. "This is designed for Soldiers serving in a remote location or at a forward operating base," Whitsitt said. "All the warfighter has to do is pull a tab and in 30 minutes they have meals for 18 Soldiers. It's a completely nutritious and balanced meal." The UGR-E contains four sealed plastic trays containing an entrée, vegetable, starch and dessert. The trays are assembled in a box interspersed with chemical heaters similar to the ones found in MREs. By pulling a tab on the unit, a Soldier releases a saline solution into the container that activates the heaters. In as little as 30 minutes, Soldiers have a hot meal. "People are loving them," said Whitsitt of the UGR-E. "There's nothing like a group meal to break up that monotony and to change things up a little bit." Whitsitt said initial contracts for the UGR-E called for about 50,000 units a year. Now, he said, demand is about 50,000 a month. Food sampling was also part of the combat feeding demonstration. 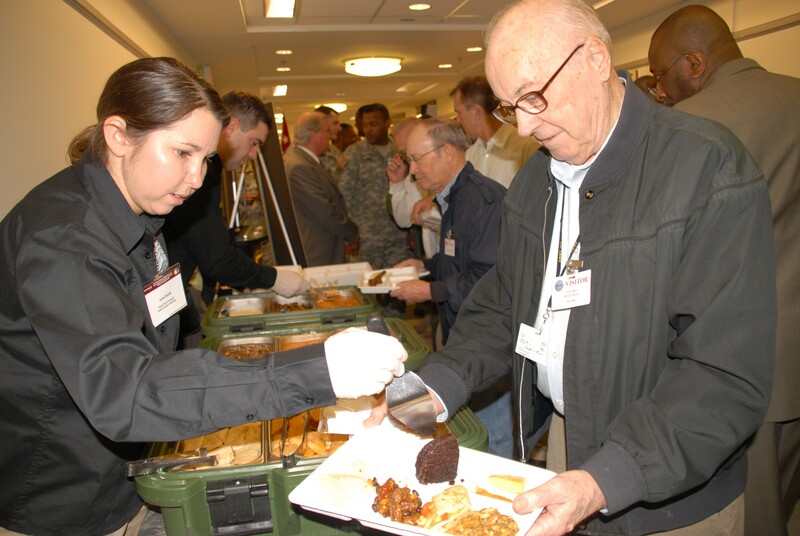 Attendees were treated to lunch or breakfast items from the Meal, Ready-to-Eat; Unitized Group Ration; and First Strike Ration feeding systems. Most of the food items offered have yet to be fielded, including: Mediterranean chicken, southwest beef & black beans, garlic mashed potatoes, beef brisket, chicken stir-fry and chocolate cappuccino cake. Among the attendees were several retired Soldiers from the Armed Forces Retirement Home in Washington, D.C.
Sgt. 1st Class (ret.) Bernard Hipchen served in Army medicine during the Korean War, enlisting in 1954. He said combat rations then required some getting used to. "It was powdered eggs and powdered milk back then," he said. "After you were eating it for a few months, then it started tasting good." The combat rations he sampled at the Pentagon required no such adjustment time, however. "This food is awesome, just awesome," he said.